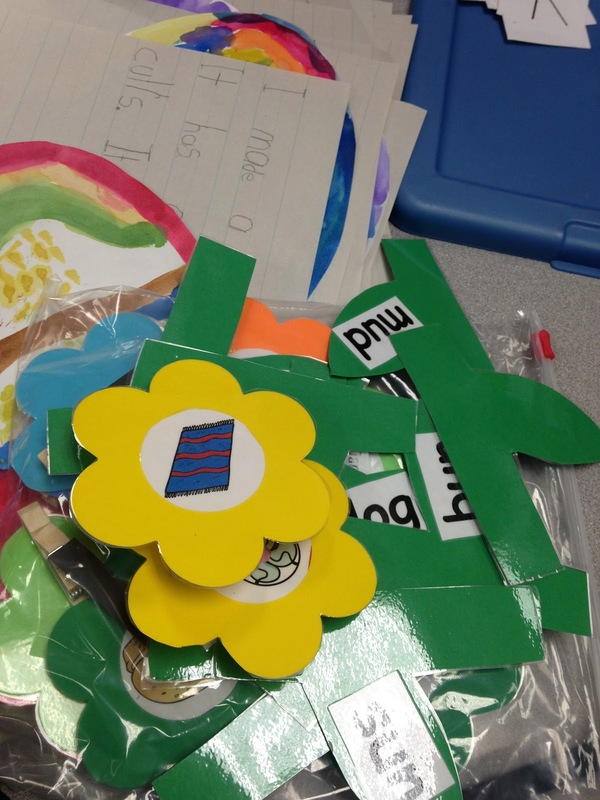 I am linking up with Doodle Bugs Teaching again! Click the picture to head over and link up! 1. This was the view today as I pulled into school. 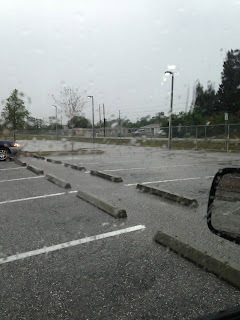 It has rained here in "sunny Florida" for two days---straight. Two days of inside recess with me supervising two classes is less then ideal. 2. Can I just say that my teaching neighbor rocks!! How cute are these? 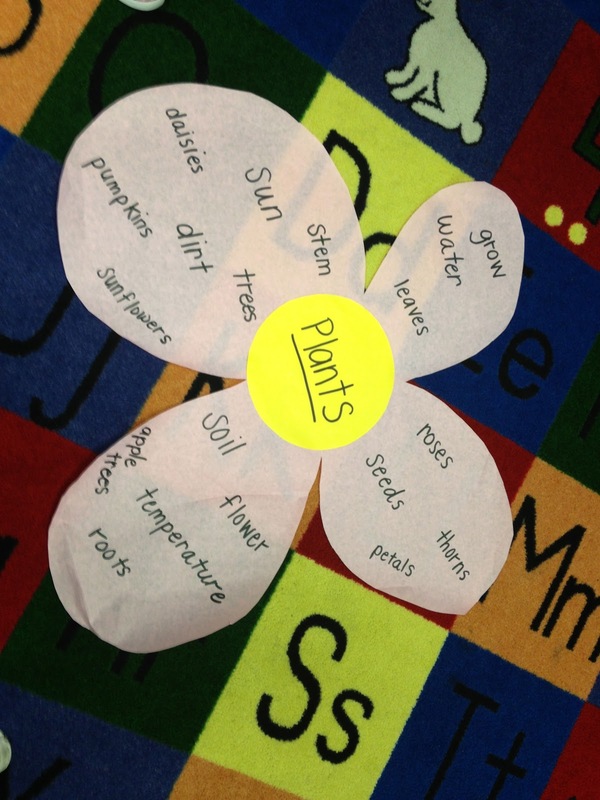 The flowers are hot glued to clothes pins and have magnetic tape on the back. The stems with the words clip right on! With her permission I am going to try to remake these this weekend so the team can have them for centers next week. PS- She claims this was an idea she had from "the dark ages." All I know is if this adorable center is from the dark ages I want to go there!!! 3. 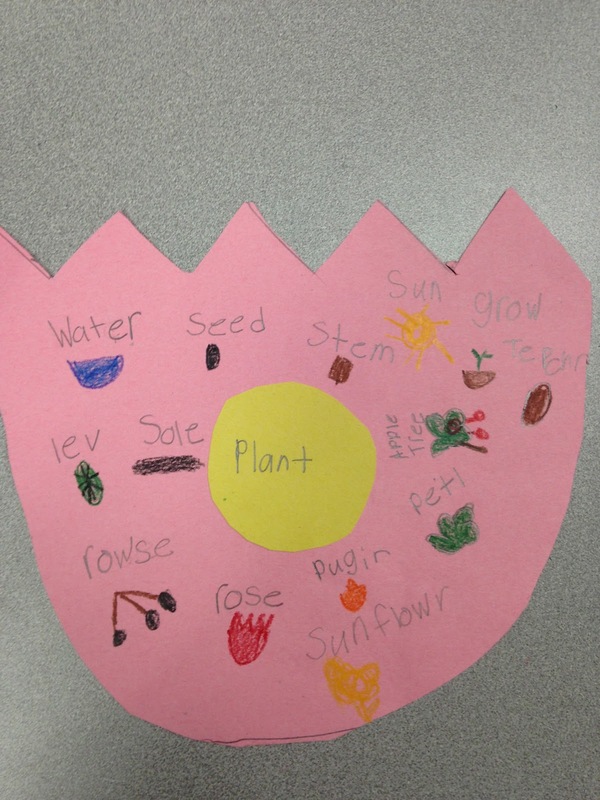 We are working from my plants unit over the next few weeks and we made these cute little circle maps to kick it off. 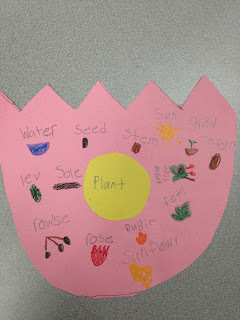 My kids had tons of background knowledge about plants and we added some to our circle map after a short video to introduce the new topic. The students made their own circle maps using large tracers and construction paper. Don't you jus love the way she spelt "roots" as "rowse?" 4. 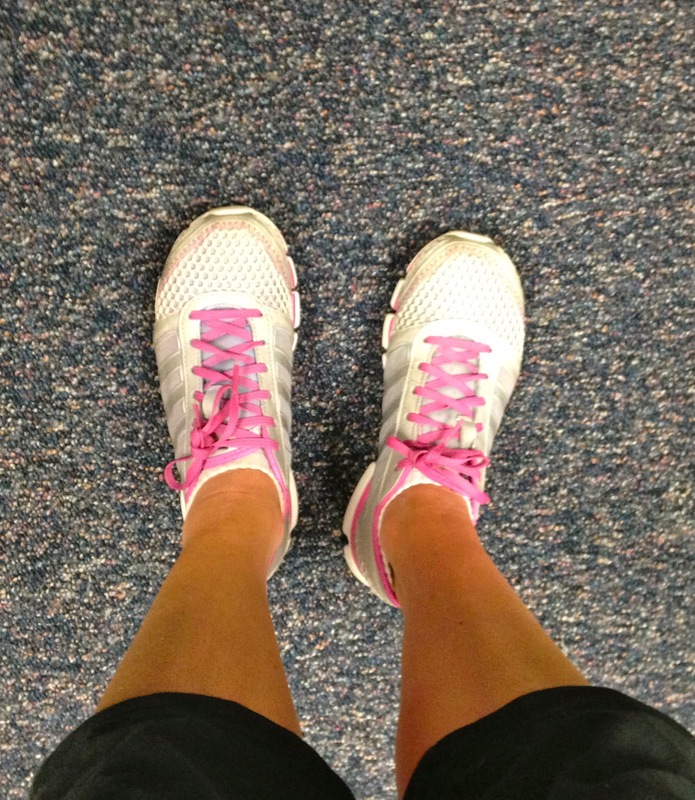 I busted out my workout shoes everyday this week! Tomorrow morning I am going to check out a gym that I am considering joining because it has no contract (so I can quit if I want!) and it is close to my house. Would it make me a gym snob if I said I refuse to join if they don't have tiny tv's in their treadmills? I would really like to watch my own shows at the gym but I am not sure that is going to happen. 5. After some discussion with my team we decided we needed two things going into next year. 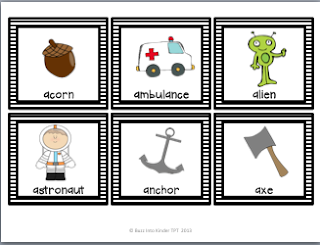 We needed to teach basic vocabulary words to some of our kids. I am not talking the words "banter, " "flutter," or "stagger." No- those are the words our reading series wants us to teach. I am talking back to the basics. We also decided that we need an alphabet reference packet. 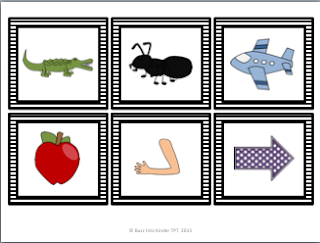 We needed to be able to pull from this packet to do beginning sound sorts, long and short vowel sorts, phoneme blending, and everything in between! I made this Alphabet Reference Cards packet to help with those needs. There are 800 cards total-- 400 with the word included and 400 without the words. I am hoping this is a packet I can add to every month with new pictures! I hope it will save the team some time and hassle next year! Hi Carrie! I'm your latest follower- I just started a blog 3 days ago so I'm not sure if I've done the Five For Friday thing correctly but I thought I'd jump in and give it a go! I think back to basics with vocab sounds like a good idea- that is this reading series that thinks "banter" and "flutter" are good first steps?! Just checked out your blog! So cute!!! Thanks for stopping by! I totally agree...only join if they have personal tiny tv's! That's the way to go! :) Happy weekend! I found one that does!! It was not the one I went to Saturday but I will drive a little further for personal TVs! I have never been to a gym with personal TV's, but now I am thinking I need to find one!! I joined the gym by my house because it was close and it was CHEAP! My membership is $10 a month. Love it! I agree on teaching basic vocabulary. I need to focus more on that on the beginning of next year with my new kinder babies especially since I have a large ELL population at my building. What an awesome giveaway you are having! So very true! She had it in her "random stuff box." We pulled it out and saved it!! Don't you hate it when it rains here in sunny fl! My poor kiddos worked soooo hard so we could go outside to play and on our way out to the playground, it began to rain... I think I saw tears in their eyes! Oh no poor babies!! Since I am year round we have to come back in July. They beg for inside recess then because its so hot!! Can you send me an email @ lalangton1@gmail.com? Jackie from Sister-Teachers is trying to organize a FL bloggy meet up and I would love to for you to be involved!